I rarely make the same drink two nights in a row. I’m developing a large home liquor selection, as well as a robust home library of cocktail books. This leads me to want to continually challenge myself to new-to-me cocktails. But for nearly a week, I’ve been drinking the same drink almost non-stop. It all started when I bought a bottle of pineau des Charentes. I had seen reference to this vin de liqueur, and it finally stuck in my mind enough to buy a bottle when I saw it. What I found is a brand called Le Coq d’Or, produced by Hardy Cognac. As the story goes, pineau des Charentes was originally an accident. Grape must was poured into a barrel for fermentation, only the barrel was not empty, it already contained eau de vie.1 When they opened the barrel later, the mixture of grape juice and brandy created a sweet aperitif that has become a tradition in the department of Charente. And a fine aperitif it is. On the rocks, this is a delicious drink, comparable in taste to a dessert wine. It comes in at 17% ABV, similar to vermouth. As luck would have it, right after I picked up the pineau, the latest issue of Imbibe Magazine arrived. It included an interview with Rachel Maddow, who suggested mixing gin and pineau in a 2 to 1 ratio. I gave this a try. And it immediately became my new favorite drink. The pineau gives a sweet, smooth background that allows the gin to really stand out without being too hot. I’ve tried this with several gins, and enjoyed them all, but really find this to be a great place to use Van Gogh Gin. At two to one, the sweetness of the pineau becomes subtle and silky. I tried a variation with orange bitters, but didn’t like it quite as much as without. But I did find adding a nice sized green olive stuffed with red pepper makes the perfect garnish. 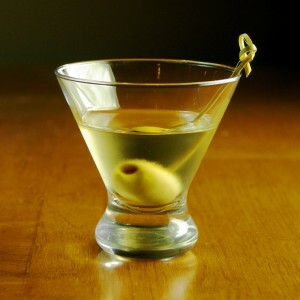 Once again, I find the reward of a savory olive at the end of a sweetish drink makes the perfect palate cleanser. While Maddow calls this a pineau martini, I felt this delicious drink deserved a name of its own. Going for simplicity, I named it after the river that gives its name to the region that gave us this aperitif. Stir and strain into cocktail glass. Garnish with large olived stuffed with red pepper. How they failed to notice it was not empty, or that they couldn’t put as much must into as they expected, I do not know. What fortuitous timing! I was given a bottle of pineau des Charentes for Christmas. Pineau is good stuff. When I was 13 I went off for a month of studying French in La Rochelle and the family I stayed with started off every meal with pineau on the rocks. I thought it was great, but couldn’t find it in the US until recently. I still like it a lot. Just to clairify what I mean by every meal– not breakfast of course. But dinner, absolutely. It depends on where you are. I can actually buy it at my local grocery store! I’d ask at your favorite wine store or liquor store. But if you can’t find it locally, some of the online retailers offer it.